In May 2004, Patrick Brown headed home as usual after playing a late “gig” with his band. About a quarter of a mile from his house in Pensacola, Florida, Patrick fell asleep at the wheel. After his SUV flipped five times, Patrick was thrown from the car’s back window and left in a coma for the next two months. When he awoke, Patrick learned that he had suffered a traumatic brain injury and demolished the T7/T8 region of his spinal cord. Only twenty years old at the time of his injury, Patrick was determined to continue to live his life to the fullest, as he had always done. 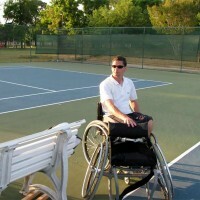 While paralyzed from the chest down, Patrick continued playing his bass guitar, took-up competitive wheelchair tennis and hand cycling, as well as other activities. Despite his energy, Patrick soon found it impossible to ignore the pressure sore he had developed from hours spent in his chair playing tennis, which was exacerbated by his use of an old mattress. In June 2015, the Travis Roy Foundation awarded Patrick a grant of $2,850 for a new mattress replacing his old one. Patrick is thrilled to have the new mattress, which has already enabled his sore to heal and allows him to get a much better night’s rest. Patrick describes the Travis Roy Foundation and its grant process as “astounding” and feels “truly lucky” to have learned about the organization.